Kate Chopin was a nationally acclaimed short story artist of the local-color school when, in 1899 she shocked the American reading public with THE AWAKENING, a novel that much resembles MADAME BOVARY. Though the critics praised the artistic excellence of the book, it was generally condemned for its objective treatment of the sensuous, independent heroine. Deeply hurt by the censure, Mrs. Chopin wrote little more and became largely forgotten. For decades, the few critics who did remember her concentrated on the regional aspects of her work. In the LITERERY HISTORY OF THE UNITED STATES, where Chopin is highly praised as a local colorist, THE AWAKENING is not even mentioned. In the 70s, however, a few critics began giving new attention to the novel, emphasizing its courageous realism. 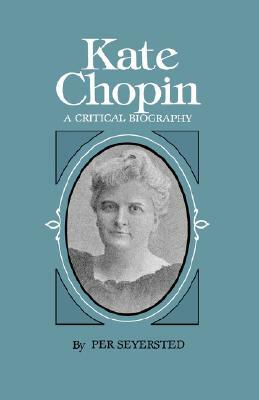 In KATE CHOPIN: A CRITICAL BIOGRAPHY, Mr. Seyersted uses her total oeuvre to present an extensive re-examination of both the life and work of the author, including previously unknown stories, letters, and a diary. Chopin was a much more ambitious and purposeful writer than previously thought. From the beginning, her special theme was female self-assertion. As each new success increased her self-confidence, she grew more and more daring in her descriptions of emancipated women wanting to dictate their own lives. Mr. Seyersted traces the author's growth as an artist and as a penetrating interpreter of the female condition, and shows how her career culminated in THE AWAKENING and the unknown story "The Storm." With these works, which were decades ahead of their time, Kate Chopin takes her place among the important American realist writers of the 1890's.